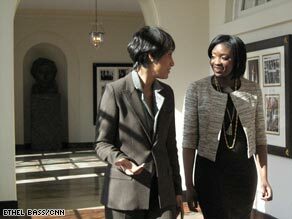 Desiree Rogers, left, and CNN's Lola Ogunnaike walk through the halls of the White House. WASHINGTON (CNN) -- Every Sunday after an interminable 90 minutes at our family church in Washington, my parents would drive the family (me, baby brother and sis) past the White House as we headed back to our modest home in the suburbs of northern Virginia.. In my younger years, it was the perfect panacea after a morning spent praying and singing hymns about lambs and lepers. As I grew older and more cynical, I wanted little to do with the White House jaunts. I longed for something a little edgier. "Can we please drive through Georgetown?" I'd ask, with attitude to spare. Checking out boutiques like Commander Salamander and Up Against the Wall, with their baggy jeans and Doc Martens boots, had become my idea of a fun-filled Sunday afternoon. Flash forward more than a decade, and I'm actually making my way into the White House. And to my utter surprise I'm actually excited - excited with a capital E.
By now I've worked as a reporter at the New York Daily News and The New York Times, written for every publication from Rolling Stone to Elle magazine, attended every major event in Manhattan. None of that was a match for the armed guards, the meticulously manicured grounds, and the 55,000 square feet of space that greeted me as I walked into the White House. In articles she has been variously described as no-nonsense and focused. All true. This was her first television interview. Some answers sounded scripted. Others sounded like they could have casually been served over crust-free sandwiches and ice tea. We talked about the family dog (it will arrive in the spring, she said) and her first days at 1600 Pennsylvania Avenue ("I used to get lost a lot," she said, smiling). She wants to make the White House accessible to all Americans. Why shouldn't Jane the waitress have a chance to mix it up with Carla Bruni and Nicolas Sarkozy? After nearly an hour, Rogers and I parted ways. She already has 14 events under her designer belt and she is in the throes of planning dozens more. I left her in her East Wing office to fret over seating charts and stemware. I asked my colleagues Ethel Bass and Daria Shelton to capture as many magical moments as their digital cameras would hold. For me, the White House will never look the same.